Founded in 1985, HDC Human Development Consultants Ltd. has established itself as an innovative forward thinking company focused on the continued development of practical, effective management systems. Through continued research and on-going training our team of experienced consultants is able to help companies from around the world become safer and more productive! See Customer Comments. For more than 25 years, the HDC team has focused its expertise on three critical areas of business. These programs are targeted to line workers, operations staff, and trades people. Each program is driven by, focuses on, and reinforces the customer's goals that address areas such as safety, equipment availability, energy conservation, product quality, customer satisfaction, corporate policy, and the optimization of all vital areas. See Customized Training. Each self-instructional training course/kit has been tested and validated by industry as a key user-friendly training resource for all levels. HDC has put an exceptional amount of effort into each course/kit, making them practical and easy to learn from on either computer or paper. For samples and a list of available courses/kits, click here. Books in The Exemplary Worker series focus on the critical thinking strategies exemplary workers use to maintain outstanding performance and contribute to business success. You will learn new thinking strategies to work more safely, effectively, and efficiently and with less effort. These thinking strategies will help you to perform better in any job and work environment. click here. The book, Interviewing to Gather Relevant Content for Training, provides a set of thinking strategies that you can use to identify relevant content and eliminate irrelevant content. One of the greatest challenges for instructional designers, writers, and subject matter experts is to identify training content that is relevant - content that contributes to improved corporate, job, and employee performance. click here. This tiered program trains people to use a structured critical thinking strategy to identify and predict hazardous situations. 90% of the participants from different industries said they would feel significantly or a major degree safer if their co-workers or peers used the strategy. Hazards exist all around. We often expect or rely on what others know. A structured critical thinking strategy empowers every employee with the tools to be proactive before work, while working and when a job is complete to identify and predict hazardous situations. 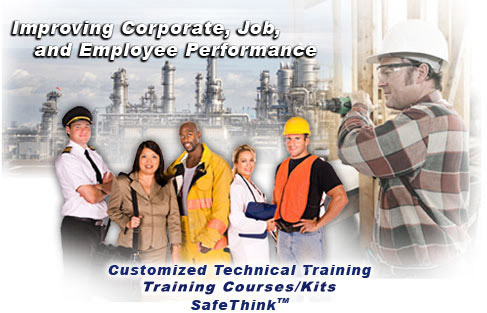 For information about the SafeThink™ strategy and courses, click here.